Ever since Sangeetha of Ghar ka Khana announced this month’s ingredient for JFI, I wanted to prepare and submit this authentic tamilian recipe. This is a classic recipe that can be found in feast menu and goes well with sambar or thogayal. In many of the recipes, eggplants are paired with a tangy ingredient. The tang compensates the meaty and slightly bitter eggplants resulting in a delicious dish. In this all-time favourite recipe of mine, tamarind provides the tang, while the spices play along, and you get a lip smacking eggplant gravy. Roast all of the above in a tsp of oil till brown. Cool and grind to a fine powder. In a skillet, heat 2 tbsp of oil and lightly roast the eggplant pieces. Add tamarind paste, salt, turmeric and ½ cup of water and let the eggplant cook. Add the cooked dal, the spice mixture to the eggplant mixture and allow it to boil for 5 minutes on a low flame. In a separate skillet, heat a tsp of oil and add mustard seeds. Once it splutters, add urad dal, curry leaves, red chillies and asafoetida. Add this to the eggplant gravy. Mix well and serve. I would like to thank Indira of Mahanandi for creating this event that lets us explore and learn with a different ingredient each month. looks delicious and yummy so many rasvangi recipe,need to try this we make it slighlty differently. Suganya, love the recipe you have here, Rasavangi is new to me thought the ingredients are all familar. a question. does the eggplant remain in chunks, or does it have to be all mashed up? 'cos i would like to try it if is mashed up. Is this called kathrikai gothsu too? b'coz you have added dhal...that's why i asked..
Bee, There is no reason why the eggplants shouldnt be mashed, although it may result in a slightly different taste. Even I dont like lightly or partially cooked eggplants. Thats why I prefer kootu, sambar or fry, so they get get cooked well and absorb all the spice. You can give this recipe a try as is. Usha, this is not kosthu. Kosthu is served with dosa or idli. This is served with sambar. Also, kathrikkai kosthu does not include dal, but mixed veg kosthu does. Hope this answers yr question. Viji, I will try that next time. Sounds good. I have a bag of brinjals at home and just have to make this. i am new to ur blog..but stopped and drooled all over the photos..yum! I found ur blog and it's very nice with those recipies.And this rasavangi recipie i never tried i will try for sure. Suganya, once again your food, photography and food stying are outstanding. I like the idea of tang with the eggplant. haven't tried rasavangi before Suganya and i saw one in MT's blog too. Would surely make this soon.. thanks for sharing. 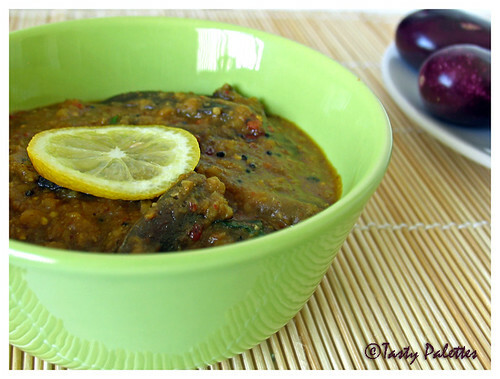 Lovely blog... and i lov brinjal like mad and i will serching all the recipes to cook a nice dish out of it. thnx for the recipe . one more to my book. A few years ago, I ate an eggplant preparation named 'rasavangi' at a restaurant. It was sweet, sour and spicy at the same time. I liked it very much and tried to experiment at home using different combinations but it never worked. Your version seems delicious and I would like to know whether jaggery can be added to this dish. Thx. One of my favourite dishes.....the pic looks delicious. Nice Recipe here as well Suganya! Is rasavangi similar to pitlai?